WHITE MALE=”BADLY VACCINE DAMAGED”=”INFERIOR”. Alfie was killed on purpose to cover this up. Last night, before he died, I posted something similar to the following and then got trolled out of it. Well, as it turns out this is true so I re-typed it. If you see anything to the contrary, it is British government trollage. Alfie Evans was born perfectly normal, and got his condition at a year old, after receiving six vaccines in one doctor visit. The vaccines triggered an auto immune disorder that caused his immune system to destroy his brain. They are saying he had defective genes which caused him to waste away but that is the unilateral universal excuse fronted for vaccine damage every single time. They always blame it on “defective genes”. FACT: Vaccines screwed up alfie, caused a brain wasting disorder, (all kids get knocked down by vaccines now, which are eugenics weapons) and the ones who take it worst die like Alfie. Only Alfie did not die from the vaccine itself, he died because they cut off food. They cut off food, because once he hit age 2, he had rights! They could not have that happening. I don’t think the British government was worried about the payout for damage, and they probably will pay out because this is such a high profile story. I believe the british government was in fact worried because this was such obvious vaccine damage, and they don’t want anyone investigating a weapon they want to keep on using. If Alfie hit 2, he’d have crossed that threshold. Thanks to Tapestry for this link. ”Life Site News is reporting that Alfie Evans was injected with four different drugs by hospital staff just two hours before he died. This, of course, was after several days of being starved to death and denied water. Virtually the entire corporate-controlled media has withheld this information from the public for a variety of nefarious reasons that I will discuss in another post……. Alder Hey hospital admits to being engaged in “live organ trade” for cash It’s not just the UK Independent that covered the illegal organ harvesting and body parts trade pursued by the Alder Hey hospital. In 2001, the BBC also published a damning story that detailed the hospital’s criminal activities surrounding organ harvesting from human babies. As the following story reports, Alder Hey sold illegally harvested baby organs for cash. There is huge demand and a market for body parts especially eyes, hearts and kidneys belonging to children. Estimates indicate that at least one million children have been kidnapped and killed in the past 20 years for organs. A kidney or eyes can fetch up to US $10,000 and a heart could cost US $50,000 or more. Estimates further indicate that money laundering in this deadly trade accounts for up to 10% of the world’s GDP, or as much US $5 trillion. As a result, the black market for children’s organs is expanding and more and more children are kidnapped and killed. 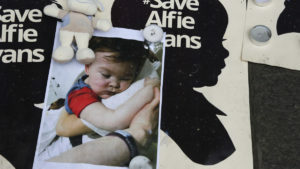 This entry was posted in Uncategorized and tagged ''Life Site News is reporting that Alfie Evans was injected with four different drugs by hospital staff just two hours before he died., (all kids get knocked down by vaccines now which are eugenics weapons), Alder Hey hospital admits to being engaged in “live organ trade” for cash, Alder Hey hospital doctors had previously conveyed to the Evans’ family in a legal document how they intended to use a drug cocktail that included Midazolam and Fentanyl as part of Alfie’s “end , Alder Hey hospital has links to illegal organ harvesting from the bodies of children, Alder Hey sold illegally harvested baby organs for cash., Alfie Evans was born perfectly normal, Alfie Evans was given 4 drugs just before he died: report, Alfie was killed on purpose to cover up the evidence of ''Vaccine Damage'', All roads lead back to the WHO/ Bill Gates and vaccine medical experiments on children, ANALYSIS: Alfie Evans was executed by lethal injection; Alder Hey hospital steeped in horrifying history of organ harvesting from human babies, and got his condition at a year old after receiving six vaccines in one doctor visit., Chemical suffocation? How Alder Hey doctors want Alfie Evans to die., forgotten-for-25-years-now-the-1000-infant-bodies-found-after-alder-hey-can-be-laid-to-rest, I believe the british government was in fact worried because this was such obvious vaccine damage and they don’t want anyone investigating a weapon they want to keep on using., The vaccines triggered an auto immune disorder that caused his immune system to destroy his brain., UNDENIABLE FACT: The British government really does not pay out if the kid dies before age 2 and for Alfie age 2 was coming up in 14 days.. Bookmark the permalink.